The foreign minister listed three examples of the way in which the current system is not meeting expectations: efforts to achieve the Millenium Development Goals are falling short of the targets set in 2001; the outcome of the Copenhagen conference on climate change didn’t reflect the seriousness of consequences of growing greenhouse gas emissions; and the Conference on Disarmament has been inert for twelve years despite the urgency of its task. But he was not principally blaming the United Nations for these and other problems – he was challenging member states to fulfil the commitments of their membership of the organisation, so clearly and strongly articulated in the UN Charter. 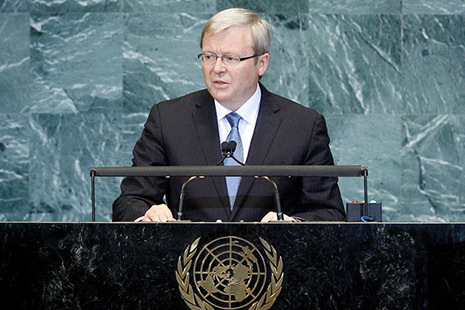 During the time that Kevin Rudd was prime minister the Australian government took a series of steps to renew and strengthen Australian engagement with the United Nations. It made explicit the centrality of Australia’s commitment to the international rule of law. It became more attentive to and involved in the discussion of issues in UN forums. It nominated for membership of the Security Council in 2013–14. It set a target for increasing overseas aid to 0.5 per cent of national income by 2015–16 and emphasised Australian participation in peacekeeping missions. And it established the International Commission on Nuclear Non-proliferation and Disarmament, co-chaired by the former Australian foreign minister, Gareth Evans. These were striking advances compared with the Howard government’s disdain for multilateral participation. But now a second round of policy renewal is needed to strengthen Australia’s role as a fully engaged UN member state. This involves addressing the inconsistencies between existing Australian policy and the responsibilities of member states, as spelt out in the UN Charter. There are five glaring inconsistencies: the offensive orientation of the 2009 Defence White Paper; the continuing underfunding of the Department of Foreign Affairs and Trade; the practical neglect of peaceful conflict resolution; the inadequacies of our voluntary financial contributions to UN programs and to overseas aid; and the failure to support public education and scholarship on multilateral cooperation. Labor’s Defence White Paper, published in April 2009, moved Australian defence strategy further from “defensive defence” towards “offensive defence.” It focused on forward projection of forces, strike capability and high-technology weapons systems. It proposed enormous purchases of weapons, which would be paid for by automatic annual increases of 4 to 5 per cent in military spending for each of the next twenty years, regardless of the circumstances. No other type of Australian public expenditure has ever been promised such largesse for such a long period. The White Paper discussed Australian defence as if it could be dealt with in isolation from other dimensions of global affairs. An early and astonishing result was the $1.57 billion increase in the defence budget for 2010–11, bringing the total to $26.8 billion. In the same budget the allocation for the Department of Foreign Affairs and Trade was $1.1 billion. So the increase in Australian military spending this year is 50 per cent greater than the total allocation for diplomacy. At a time when we have a quarter fewer diplomats posted overseas than in 1996, and when we are threatened by no country nor are likely to be in the foreseeable future, this seems utterly irresponsible. Australia has only ninety-three overseas missions compared with the average among western governments of 150. Yet diplomacy is the prime means of avoiding conflict as well as of representing Australian interests overseas. Why should Australia stand out among developed countries in lacking an adequately funded diplomatic service? Recent media reports suggest that a “stringent” review of the White Paper is under consideration, a welcome development that should lead to a decision to abandon or cut back some of the misconceived and wasteful proposed equipment purchases. If this happened it would release funds for the activities in which the defence department is actually engaged at the moment – predominantly peacekeeping – and for a rapid expansion in diplomacy, peacemaking and peacebuilding. 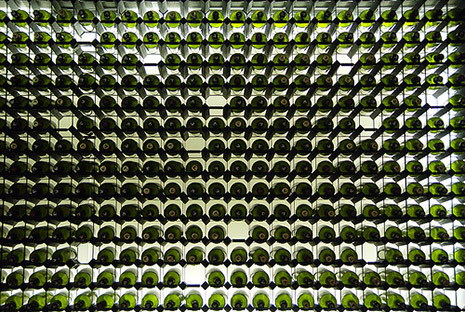 To maintain international peace and security, and to that end: to take effective collective measures for the prevention and the removal of threats, and for the suppression of acts of aggression or other breaches of the peace, and to bring about by peaceful means, and in conformity with the principles of justice and international law, adjustment of international disputes or situations which might lead to a breach of the peace. Since the end of the Cold War the number of military conflicts and the number of war deaths have declined significantly. In the early 1990s the number of conflicts each year causing 1000 or more battle deaths was over fifty; that has fallen to thirty-six. The end of colonialism and of the Cold War, and the growth of economic interdependence have been influential factors, but so too has been the growth in international peacemaking efforts by the United Nations and particularly by Norway. The Norwegian approach offers valuable lessons for Australia. Norway’s Ministry of Foreign Affairs very rarely acts alone: it often cooperates with the good offices of the UN secretary-general and the new UN Mediation Support Unit and with other countries and NGOs working on mediation. Major development assistance has commonly been a feature of peace processes. Norway also has the advantage not only of having never been a colonial power but also of being largely free of exploitative corporate or military involvement in developing countries. The Peace and Reconciliation Section was established in the ministry in 2001 and now has fourteen professional officers and an annual budget of about US$100 million supporting activities in twenty areas of conflict. Australia could become a peacemaker too. Australia has a proud record of support for UN peacekeeping, most recently within our region in Timor-Leste, Bougainville and the Solomon Islands. Australian leaders on all sides of politics have frequently talked of our geographic location as the basis for building a bridge between developed and developing countries, though rarely have they been sufficiently imaginative or generous about policies to implement that vision. One of the many interesting discussions I had while in Oslo recently was with Kristian Harpviken, director of the Peace Research Institute Oslo. When I asked him whether he thought there was room for Australia to become involved in peacemaking he said that within Norway there is currently much talk of the dugnad principle – the value of community effort in resolving a conflict. As an example he mentioned the international effort to resolve the conflict between the Luos and the Kikuyu after the presidential election in Kenya in December 2007. That successful peacemaking effort involved concerted engagement by several countries and international NGOs led by the former UN secretary-general, Kofi Annan. As far as I know, not a single Department of Foreign Affairs and Trade officer is working full-time on peaceful conflict resolution. The department would have to build its capacity in the field by, for example, establishing a branch of professional staff trained in mediation and the other means suggested in the UN Charter for peaceful settlement of disputes. Establishment of such a unit would be made possible if the essential substantial improvement in the department’s funding was forthcoming. Little needs to be said about the fourth inconsistency between Australia’s obligations as a UN member state and our actual performance. Our overseas aid this year is 0.33 per cent of national income, far short of the UN target (0.7 per cent), the actual performance of the European Union (0.48 per cent), and Norway’s contribution (1 per cent). Both Kevin Rudd and Julie Bishop have promised to reach 0.5 per cent by 2015–16, but even if that is achieved we will still be notable for our meanness. And that lack of funds prevents Australia from providing voluntary support for UN programs that currently receive much higher levels of support from northwestern European countries. And finally, returning to the Norwegian model, one of its most striking features is the importance it places on the role that NGOs and academic bodies play in Norway’s support for the international rule of law, understanding about the United Nations, approach to peaceful conflict resolution and economic and social development. The outstanding Norwegian Institute of International Affairs, for example, has a staff of about seventy largely paid for by the government. If we learnt that lesson alone, Australian scholarship and public debate about international relations would be transformed. John Langmore is a Professorial Fellow at the University of Melbourne. He is a former federal member for Fraser and was a divisional director at the United Nations.